This was my grandfathers razor.The only marking I can find is "Sterling".The handle is 'scored' for a better grip. This is new but very similar. I can't find one with a sterling Mark. This is vintage. 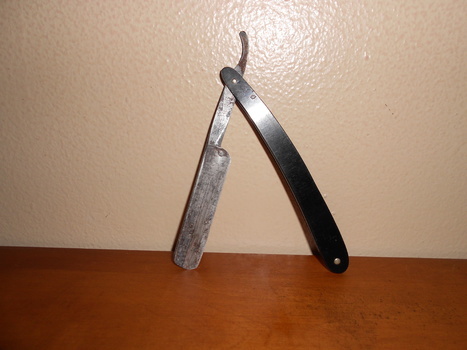 Peasejean55,the handle is bakelite type material. Oh sorry, from the flash at the I thought it was silver. So what is the colour? I meant to say top, lol. Black and scored for a better grip. If you google in the info you have about the razor it might come up with something. There are lots of sites, so hopefully you may be lucky, so good luck.